Last year, Maine, California and few other states have all voted to legalize marijuana for recreational purposes and many of which include the ability for residents to cultivate their own cannabis either indoors or out depending on local ordinances. Though details of cannabis cultivation laws vary by location, we know that California and Massachusetts residents will be allowed to cultivate six plants per person or 12 per household, and that Maine and Nevada residents will likely be able to do so soon as the new laws unfold. For those living in one of these places with an itchy green thumb, planning a first marijuana grow can be an exciting endeavor. To help the process go smoothly, we’ve developed this guide to growing marijuana indoors. There are two ways to begin a cannabis grow – either with seeds or clones – and it’s important to consider the benefits and draw-backs of both before beginning the cultivation journey. For example, while clones may reduce cultivation time, seeds are less likely to contaminate a grow area. This is especially important in an indoor environment because it will not contain beneficial insects and other natural pest control options. Next, consider the best species and strain type to grow. In an indoor grow, space and time restrictions are typically stricter, requiring careful consideration about both species and strain type. For this reason, we recommend beginning with an indica or indica-dominant hybrid which tend to grow shorter, denser and quicker rather than their sativa-dominant counterparts that tend to grow tall, large and take their time to mature. Each phase of the grow cycle has unique lighting requirements. Seedlings just starting to sprout do best in total darkness until they have reached a height of about two to three centimeters. At this point they can be transferred to a grow medium (if not already) in preparation for the vegetative stage which requires ample light each day – between 13 and 24 hours, in fact. It is during the vegetative stage that the plant gains the bulk of its mass and will grow more rapidly the more light it receives, though many argue that the plant gains strength during darkness and therefore insist on a 16/8 light cycle during this time. Once the plants have grown to a sufficient size (which should be about half its final size), it’s time to switch to the flower light cycle: 12 hours of light and 12 hours of complete darkness. When growing outdoors, this happens naturally beginning in late September as the days get shorter, but must be artificially created indoors for any non-auto-flowering cannabis plants. The light cycle is not the only facet to consider when planning lighting for your cannabis grow. Different grow lights offer different spectrums, intensities and, of course, price tags. 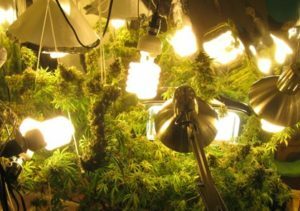 Check out our guide for finding the best grow lights for your budget to decide which lighting option is best for you. Lighting is an important part of a successful grow, but can become quite the nuisance when it comes to heat output. Cannabis plants require precise living conditions if they are to produce high-quality cannabis with minimal seeds and excessive temperatures (among other things) can compromise this outcome. 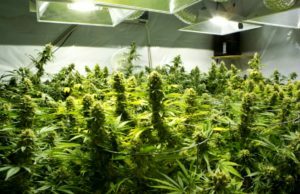 Marijuana plants should be kept between 66 and 76 degrees Fahrenheit, which may fluctuate greatly depending on the location of the grow; plants grown in a basement or garage may experience a more drastic drop in temperature at night when the lights go off so plan your location carefully. 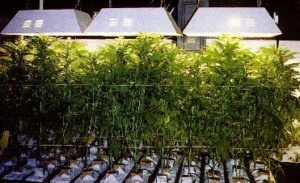 Conversely, plants kept under hot lights for long periods may burn or become stressed and produce seeds, making temperature control a pretty big deal. Though there are some lights you can use to cut down on heat, you’ll often end up reducing the final harvest yield as well. This is one reason ventilation is so important for indoor grows. An easy ventilation system can be installed by pumping heat out of the top of the grow box while replacing it with cool air near the bottom. This will also help control carbon dioxide levels as well as humidity which should be kept between 40 and 70 percent – any less and your plants could dry up and die, any more and they risk developing mildew. A hygrometer can help track the humidity of your grow room. Nutrients are another important part of a healthy cannabis grow. Like us, marijuana requires a balanced diet to grow to its fullest potential which differs depending on the stage of growth. Plants in a vegetative stage, for example, should receive more nitrogen than phosphorus or potassium because the nitrogen helps promote stem and leaf growth. After switching to the flower cycle, the plants will require more phosphorus to help buds swell, and less nitrogen to discourage long, stringy buds from forming. Finally, indoor grow areas will need to be kept sanitary to avoid pest infestation. As mentioned earlier, one easy way to do this is to avoid introducing clones (which could be contaminated either from another grow or from the environment during transportation) by starting with seeds instead. You should also clean the grow area thoroughly with a bleach and water solution prior to beginning a grow and always wash hands and remove excess clothing before to entering the area. If pests do move into your cannabis grow room, you should be able to get rid of them with organic sprays on the underside of the foliage (in the case of an aphid infestation, for example) or by modifying the grow conditions (like letting the top few inches of soil dry out to deter fungus gnats). There are many resources available to help teach you what you need to know to grow dank weed, but perhaps the best teacher is good ol’ fashioned experience. So read up, plan your supplies and dig in. Your adventure in cannabis cultivation is just beginning.